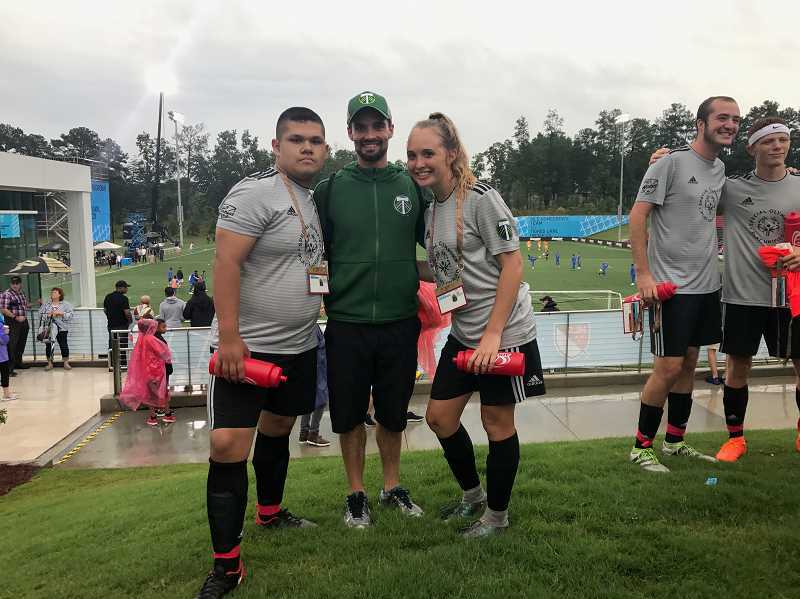 Kendall Taylor and Jose Flores Chavez said they felt like celebrities last week during a trip to Georgia to participate in the Special Olympics Unified Sports All-Star Soccer Match, where they represented the state of Oregon's Major League Soccer (MLS) team, the Portland Timbers. The two Wilsonville High School juniors are involved with the Unified Sports Program, which allows athletes with and without intellectual disabilities to play on the same athletic team. They were nominated by Special Olympics Oregon to play in the unified all-star match Tuesday, July 31, at Children's Healthcare of Atlanta Training Ground, one day before the 2018 MLS All-Star Game. "That was a lifetime experience," said Taylor, a West Linn resident who plays varsity for WHS and club soccer year-round. The all-star teams are comprised of the best MLS soccer players from the Eastern and Western conferences. Hosted by MLS WORKS and ESPN for the fifth year, the unified all-star teams — a total of 42 delegates made up of unified sports players and a partner player (an athlete involved with unified sports who does not have an intellectual disability) — represented their respective MLS teams. "This is a good program in my eyes because you get to know people that maybe you would never know and get to see how happy this makes them," Taylor said. "When you help out with this group you get to see how amazing these people are, like you don't see differences, you just see them for who they are and how amazing they are." Flores Chavez has been playing on WHS's unified soccer team since he entered high school and said it was exciting to be honored as a unified player for Oregon. He said he enjoyed showing off his soccer skills. For Taylor, she got involved with the unified program — both basketball and soccer — at WHS last school year, but has played soccer since she was four. The two soccer players flew to Georgia with the coach delegate Charlie Newton, unified soccer coach at Rainier High School, Monday, July 30. Taylor said the first day was spent practicing with fellow players in their respective conference and going out to dinner to get to know everyone. On Tuesday, July 31, the unified sports all-star game was delayed due to thunderstorms and players only had 30 minutes on the field. The two teams tied 1-1.
divisions; we felt more unified." Flores Chavez said he felt good about the game and the challenge it provided. "It was different," he said. The next day, Flores Chavez and Taylor were able to watch the 2018 MLS All-Star Game where the best players in MLS played Juventus FC, reigning champions of Italy's Serie A for the last six seasons and the Union of European Football Association Champions League finalists in 2015 and 2017, the following day. Both the unified and the MLS games aired on ESPN and for the four days Flores Chavez and Taylor were in Georgia, they made it on Portland Timbers and Special Olympics Oregon social media sites, met professional soccer players, received special gear and had players sign their jerseys — a moment of fame. "Such an amazing experience," said Kelly O'Connell Taylor, Kendall's mother. "Charlie said when we picked them up that they were treated like celebrities the whole week, such a huge honor and just a once-in-a-lifetime experience to meet all these people that are like them that play for unified sports — to have that common bond, we were told they would become like family and they did." Taylor and Flores Chavez were asked to participate in another unified sports game Aug. 26 against the Seattle Sounders unified team, where they will play in the morning and in the afternoon before a Portland Timbers game. But what both Taylor and Flores Chavez walked away with after this most recent match was a special bond and family-like connection with the other delegates. The two students will continue playing soccer and being involved with unified sports. "After this trip I never want to stop helping out with this group," Taylor said. "We just connected so well and I feel like every single person was going to be my friend in the future."